Showing 35 articles from August 23, 2017. Can making legal moonshine spark new 'spirits' of development? LOUISBURG -- Downtown soon might have a new spirit -- spirits, actually -- following unanimous action by the town council Monday that will permit construction of a custom distillery. Carolina Comfort Distiller, Inc., received permission to operate a distillery to produce, market and distribute liquor and other spirits. 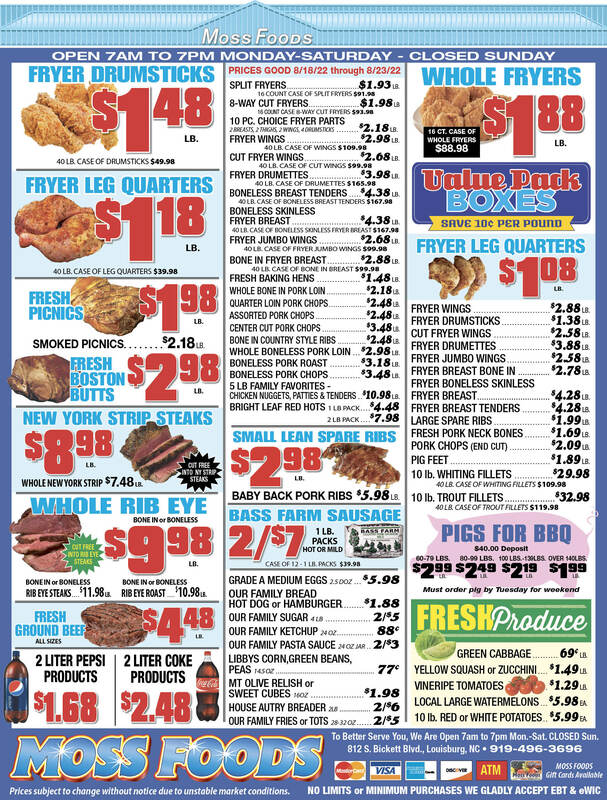 The company is owned by Randy and Shelby Moore and Frederick and Lucille Monks of Youngsville. LOUISBURG -- Commissioners received two updates this week: one that would allow new development to blossom in Franklinton and Youngsville, and another update regarding an old development -- the old jail on E. Nash Street. In February, county commissioners committed to spend up to $60,000 for engineers to design and get permits for a new pump station in Franklinton. No pulling the wool over their eyes! BUNN -- As a homeschool teacher who suddenly found herself flush with plenty sheep, Alesia Moore figured she'd better get good at fuzzy math. In this case, the fuzzy refers to wool and the math was exponential -- taking one sheep, plus a love of 4-H to end up with a business that has equalled success for three generations. "We got involved with sheep and decided we wanted show wool sheep," Moore said of she and her son, Joey, who was a 4-H'er for years before he aged out. 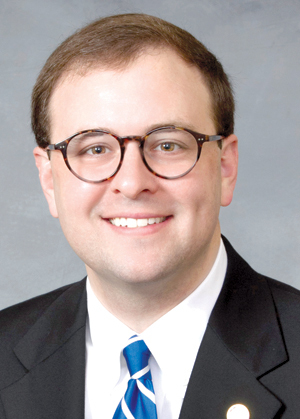 RALEIGH -- State Senator Chad Barefoot announced he won't seek re-election, moments before newly proposed legislative maps double bunked his district. Barefoot was first elected to the General Assembly, representing all of Franklin County and portions of Wake County in 2012. Lawmakers drew new state Senate and House districts after courts ruled that the current maps, drawn in 2011, are unconstitutional racial gerrymanders. Nine of the state's 50 Senate districts were deemed unconstitutional, along with 19 House districts. FRANKLINTON -- A local Girl Scout Troop and town officials have joined forces to install volleyball in the town's rejuvenated Parks and Recreation program. Commissioner Brad Kearney, Police Chief John Green and Sgt. Drew Bishop began work to restore the program more than a year ago, beginning with its inaugural t-ball and baseball season in the spring of 2016. Basketball and soccer have followed. The next decade will bring massive change to central Franklin County and Louisburg, change that is almost unimaginable at the moment. 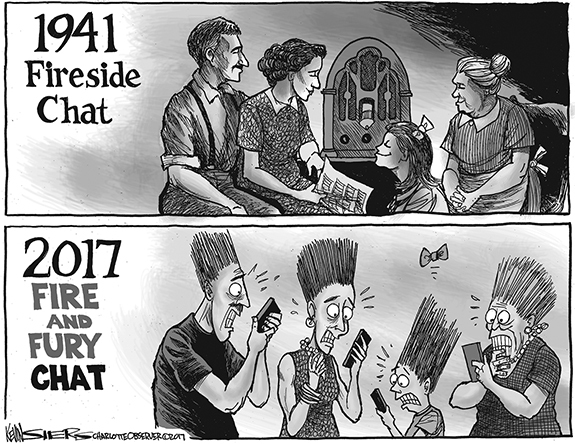 But the die -- actually dies -- are cast and barring an unforeseen catastrophe or economic collapse on a massive scale, change is inevitable. We're not ready. Not by half, yet the clock is running. Here is what we know about now -- and as these changes happen, other changes will grow from them, often quickly. 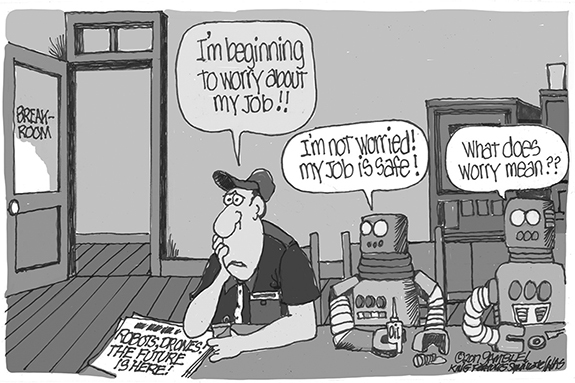 Could a proposed new law possibly be worse? Perhaps it's time to create a Hippocratic oath for our state General Assembly along the theme that doctors have used for centuries. For physicians, the first part of the oath states simply: First, do no harm. 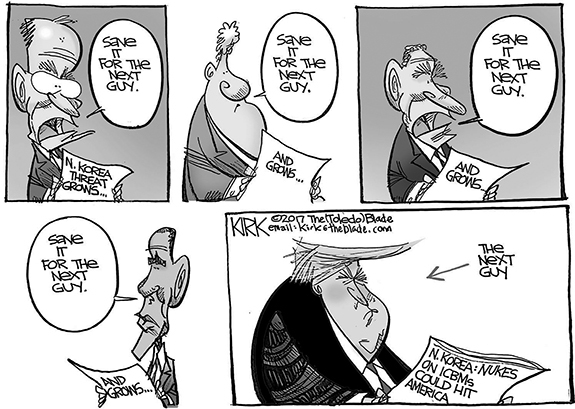 And that would be an excellent starting place for our state legislators who have done our state and our collective reputations a great deal of harm in recent years -- and are now considering legislation that is appalling in its stupidity. I must admit, the prospect of a total solar eclipse did not capture my imagination. Don't get me wrong, astronomy has always interested me. My favorite television franchise is Star Trek and the Star Wars franchise has put out some of my favorite movies. And, I remember as a kid, witnessing my first solar eclipse, placing a pinhole in an old cereal box to watch the glory of the heavens unfold inside a cardboard box. I was born in Louisburg. My great-granddad was in Co. B 66 NC Regt in the War Between the States. I have family that were in WWI and WWII. My dad's baby brother joined the Navy when he was 17 and was on PT boats in the Pacific. My wife's dad was in the 40th in the Pacific. I was in Charlie Company 5/60 INF. 9th Div. 67/68. 'New' America, land of inclusion? Welcome to the new America, the land of diversity. It is the land of inclusion, tolerance, love, and equality for all races, religions, cultures, and perversions--except for Confederates, Southerners, Whites, and real Christians--the deplorables. In the name of diversity, the deplorables must be hated and excluded. LOUISBURG--Funeral services for Ray Bandy Alston, 60, who died Monday, Aug. 21, 2017, will be held Saturday, Aug. 26 at 2 p.m. at Hickory Grove Baptist Church in Castalia, with the Rev. Bobby Thomas, officiating. 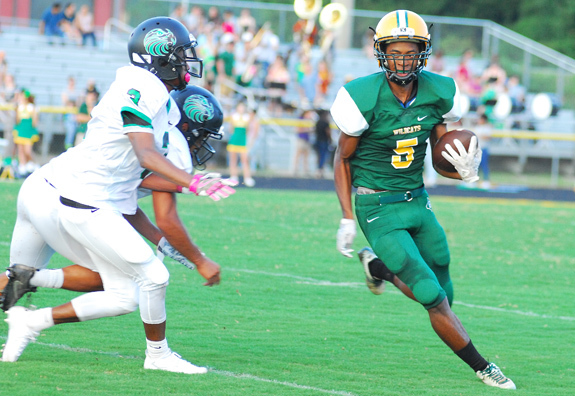 Bunn's Jacoby Rogers (right) scores the first touchdown of the season for the Wildcats -- and the first with David Weathersby as the head football coach -- during last Friday night's victory. BUNN - David Weathersby's first game as the Bunn High School football coach was certainly one to remember -- and might go down as one of the wildest finishes in Franklin County history. 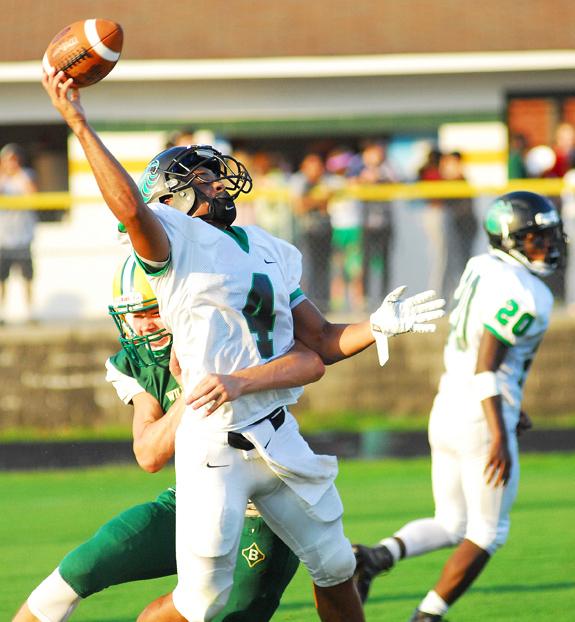 Trailing by 10 points in the closing minutes Friday night, Bunn somehow managed to keep drives alive with a pair of clutch fourth-down conversions -- one of which was a touchdown. MOXLEY MASHES ONE. 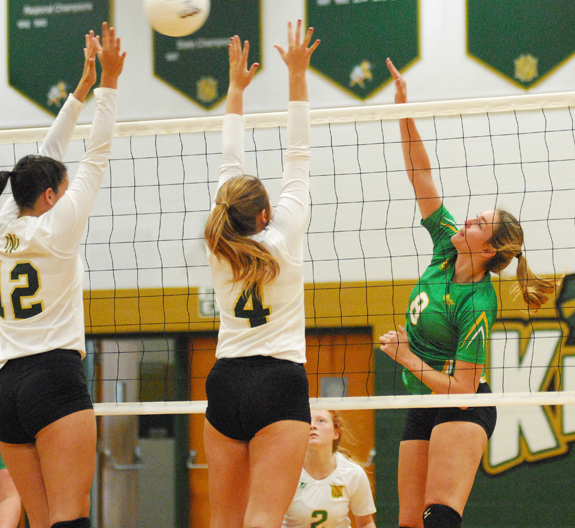 Bunn's Savannah Moxley (right) delivers a blast for the Ladycats during last Wednesday's victory at Northern Nash. RED OAK -- A new era has begun, but the results continue to be the same for the Bunn High School volleyball coach. Long-time assistant Melanie Lovin is now the head coach for the Ladycats after the retirement of the legendary Henry Jones. Lovin has picked things up right where Jones left off with a pair of first-week triumphs. 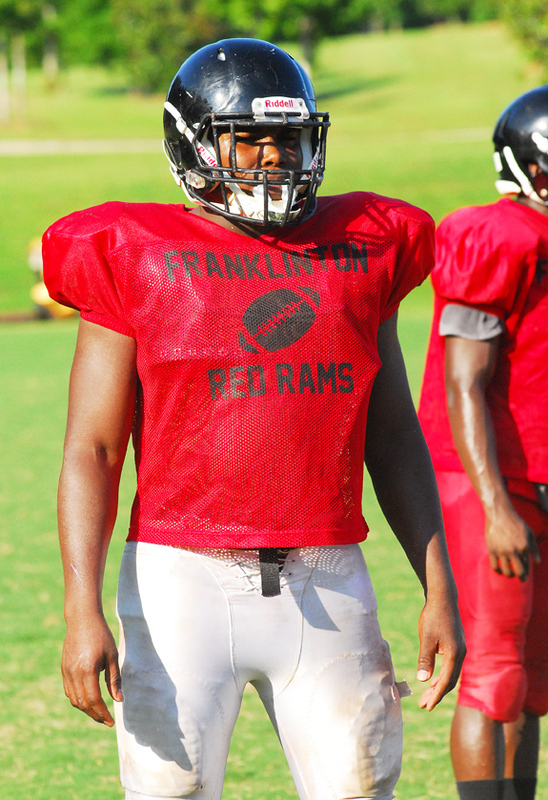 HENDERSON -- It wasn't the most masterful offensive display for the Franklinton Red Rams, but the team's defense more than made up for it. 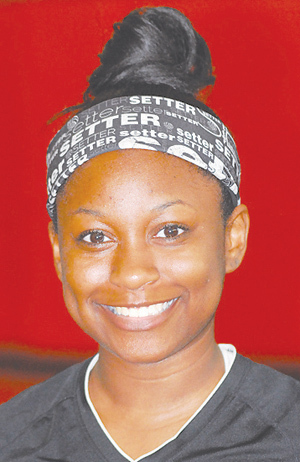 Franklinton forced six turnovers en route to securing a 12-0 road decision last Friday over the Northern Vance Vikings in the regular season opener for both teams. FHS, coached by JeVar Bransome, came through with four interceptions and two fumble recoveries. Senior Kyeon Spencer forced a fumble off a sack from his linebacker position, and he also found the end zone on a 30-yard rushing touchdown. FRANKLIN COUNTY -- After a slow beginning to the campaign, the Bunn Wildcats roared back into form Monday with a boys soccer. BHS scored two goals in the first half and never looked back en route to defeating Oxford Webb by a 5-1 tally at home in the first Northern Carolina Conference match of the season. Bunn stepped out of NCC action on Wednesday for a tough road test against the Clinton Dark Horses. GASTON -- Louisburg High School was dominant on both sides of the ball en route to defeating host KIPP Pride last Friday in the regular season football opener for both clubs. The Warriors racked up 230 total yards of offense and pitched a shutout on defense as part of a 41-0 triumph in a duel of former conference rivals. CHICAGO -- Bunn's Tarik Cohen is off to a tremendous start to his National Football League career with the Chicago Bears. Cohen, a running back, has rushed for 116 yards on 18 carries during the Bears first two preseason games. Cohen, who starred at Bunn before enjoying a prolific career at North Carolina A&t, delivered 77 yards on just 11 attempts during last weekend's victory over the Arizona Cardinals. WINSTON-SALEM -- Lucas Erceg hit a solo home run in the second, Trent Clark drove in a run and stole two bags and Luis Aviles went 2-for-4 with two steals, but Marcos Diplan allowed seven runs while pitching into the sixth as the Carolina Mudcats lost 7-3 to the homestanding Winston-Salem Dash on Tuesday night in a Class A Carolina League baseball matchup. 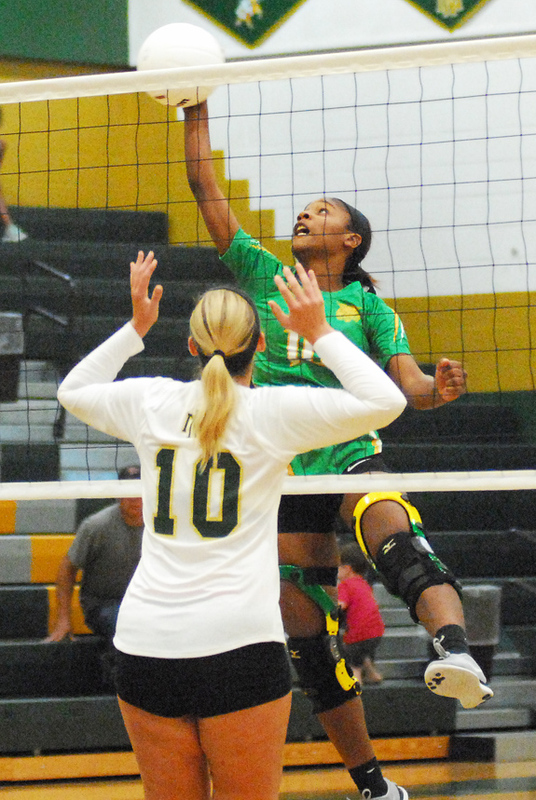 Bunn's Bernadette 'Butterball' Cooke delivers a kill against spike opponent Northern Nash. Bunn High School senior linebacker Dylan Timberlake was exceptional on defense last Friday night for the Wildcats -- including this quarterback hurry. 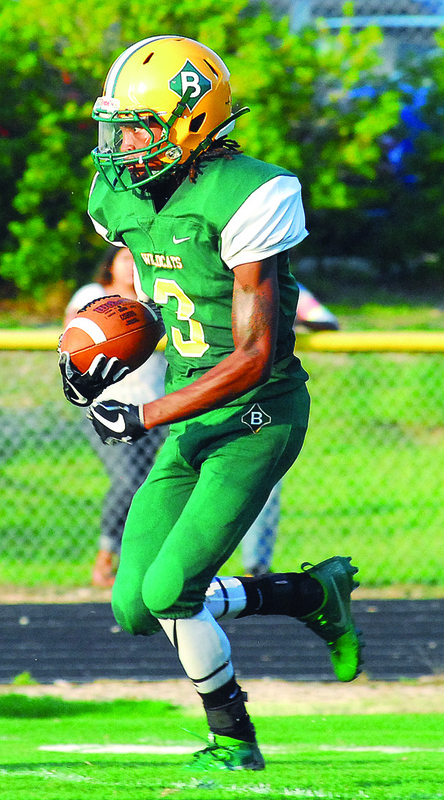 Tyre Davis, a transfer from Louisburg High School, had a big game for the Bunn Wildcats last Friday as part of a home decision over North Lenoir. HENDERSON -- High school students from across the region recently attended "Mini-Medical School" camps organized by the Wake Area Health Education Center (AHEC) in partnership with Vance-Granville Community College. 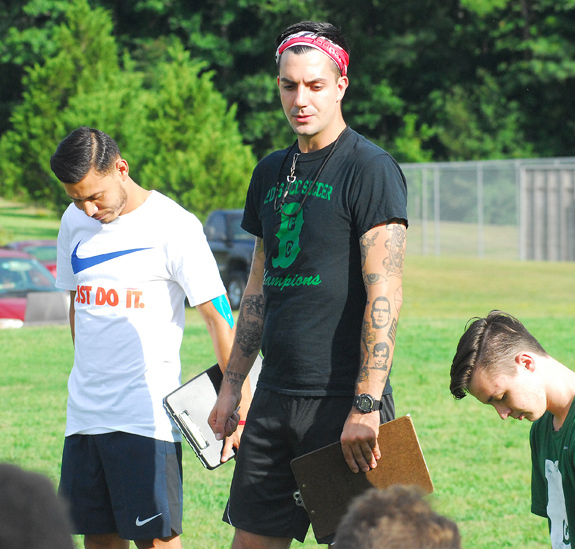 The camp was held first in June at VGCC's South Campus, located between Butner and Creedmoor, and in July at the college's Franklin County Campus, just outside Louisburg. Between the two locations, 44 students completed the program. GREENSBORO -- Eleven Vance-Granville Community College students were formally inducted into the North Carolina Piedmont "Regionally Increasing Baccalaureate Nurses" (RIBN) program in a ceremony on Aug. 4 at North Carolina A&T State University's Union Square Campus in Greensboro. RIBN is a partnership involving the university, VGCC, Davidson County Community College and Guilford Technical Community College. 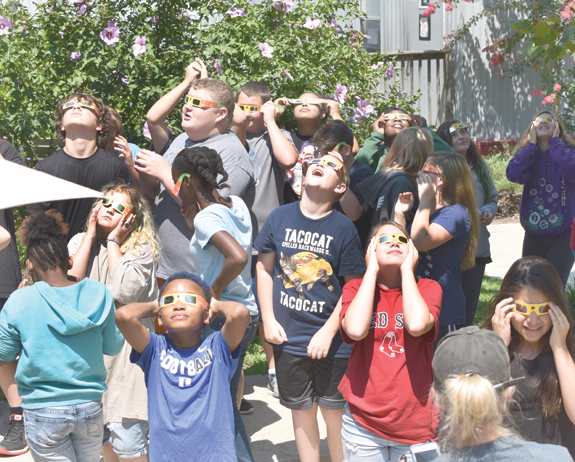 These students at Cross Creek Charter School in Louisburg did exactly what millions of other Americans did on Monday, they donned their eclipse glasses and watched a rare natural phenomenon. Although the weather was great for viewing, most local observers said the actual local event didn't exactly live up to all the pre-eclipse publicity -- but many agreed it was worth stopping and watching for a few minutes. LOUISBURG -- Police arrested two teenagers accused of beating and robbing a Louisburg woman. It turns out, the duo are also suspects in a rash of vehicle break-ins being probed by the Franklin County Sheriff's Office. Mesiah Rice, 16, of Louisburg, was charged with two counts of felony common law robbery. A 13-year-old was also charged with robbery in the matter. According to authorities, the two teens beat and robbed a 56-year-old woman at her home in the 600 block of N. Main Street. A Louisburg man died following a head-on collision this week. According to a report by Trooper P.L. Clayton, Steven Page was driving west on N.C. 561 just before 6:45 a.m. on Aug. 22 when he attempted to pass a vehicle. The 28-year-old drove his Nissan into the path of an oncoming Mitsubishi driven by Steven Claiborne and they collided, head-on, just west of Leonard Road -- about a mile from Claiborne's Kennedy Road home. LOUISBURG -- The Franklin County Board of Commissioners have called a special meeting on Friday to review a potential lease for a new hospital. Novant shut down its hospital operations in October 2015. A year later, Franklin County began negotiations with Duke Lifepoint to bring medical services back to the Louisburg site, most notably, bringing back an emergency room, behavioral health beds and other services that could be sustained at the location. FRANKLINTON -- Organizers plan to start a Boys and Girls Club in town next month. Their efforts were bolstered last week when Franklinton's Board of Commissioners agreed to provide the club with $5,000 to help with the startup. John Allers, a supporter of the Boys and Girls Club, said the organization will be a boon to children in Franklinton and the surrounding area.